Can You Drive on Winter Tires Year-Round? The expense and inconvenience of having to switch summer tires for winter and back again once the season is over makes the option of simply driving on them year-round very tempting. 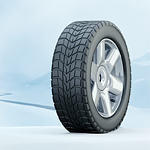 Winter tires are constructed differently, however, and driving on them throughout the year can be more expensive than the cost of replacing them with summer tires. Winter tires can be studded or unstudded, but both varieties have deeper tread patterns and rubber that remains soft in cold temperatures. When temperatures rise, this rubber blend can become a liability, wearing out quickly on hot roads. Studded tires can damage asphalt, leading many states to banning them for off-season use. If you're driving on studded tires in the summer, there may even be a law against it in your state. The deeper treads also won't improve traction and will wear quickly, causing you to replace the tire sooner and costing more money in the long run.